What's an Italic and Are You One of Them? Piero Bassetti with his book "Let's Wake Up, italics! 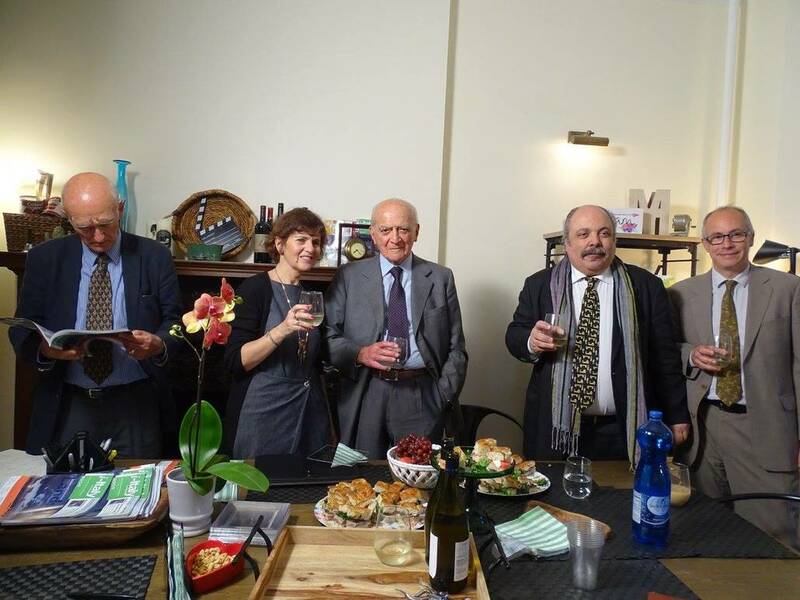 Manifesto for a Glocal Future"
i-Italy's Editor in Chief, Letizia Airos, with Bassetti, Plotkin, and other guests at La Casa di i-Italy. There are over 250 million “Italics” in the world, and perhaps you’re one of them! 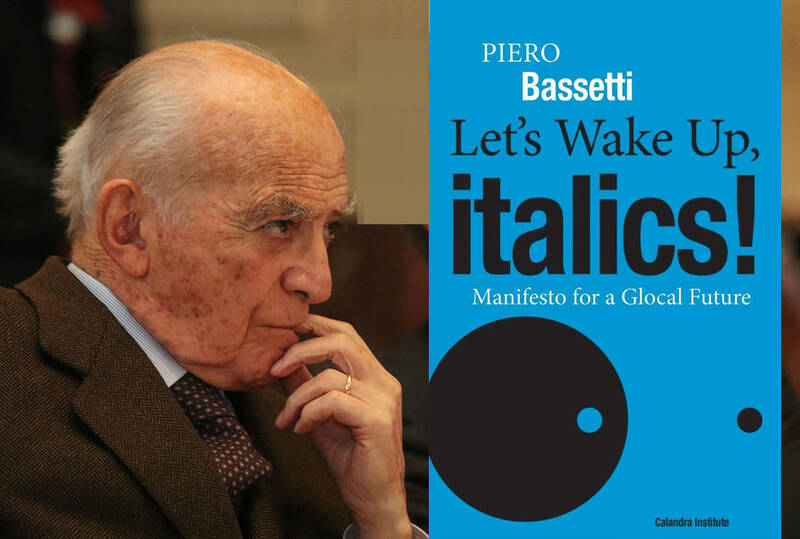 On occasion of the recent English publication of Piero Bassetti’s book “Let’s Wake Up, italics! 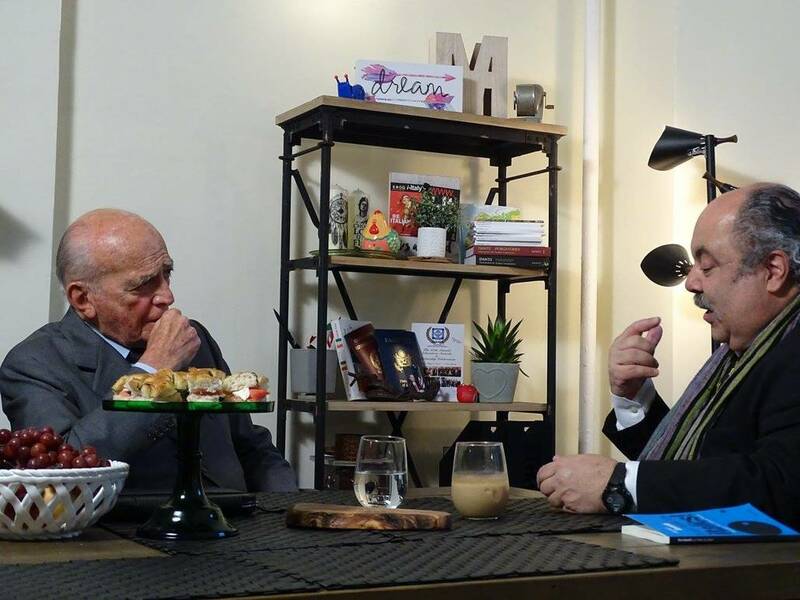 Manifesto for a Glocal Future,” i-Italy hosted a conversation between the author himself and Fred Plotkin, one of America’s foremost experts on opera and Italian culture. The conversation discussed what an “Italic” is and how Italics fit into the larger global society. The book “Let’s Wake Up, italics!” is published by the John D. Calandra Italian American Institute. What exactly is an “Italic”? Most people believe they know what “Italian” means, but “Italic” is perhaps unfamiliar to many–at least in the traditional sense of the word. In order to better understand this newly coined term, i-Italy invited Piero Bassetti (politician, entrepreneur, and the author of Let’s Wake Up italics! Manifesto for a Glocal Future) and Fred Plotkin (an expert on opera and all things Italian) to La Casa di i-Italy to flush out the idea of an Italic and how Italics are becoming increasingly important in the world. The conversation was held on occasion of the John D. Calandra Italian American Institute’s recent publication of Bassetti’s book. Fred Plotkin: First of all, I wanted to ask you for those listening, and also for me, to define some words so that we are very clear on the meaning of everything. What makes an Italian? Piero Bassetti: An Italian is an Italico who lives on the peninsula, the territory of the Italian Republic, which is a territory that has been defined as such for only 150 years. Dante, for example, is an Italic. He is not an Italian. We can call him an Italic, but in theory, we can not call him an Italian because during his lifetime, the “Italian” dimension only existed through linguistics and that’s it. Maybe also culturally but certainly not politically. FP: So then let's define an Italic. PB: An Italic is a person who chose to prefer the Italian way of life as an expression of a civilization amongst the greatest civilizations in the world. FP: When I read your book Let’s Wake Up, Italics! something immediately came to mind, and tell me if you don’t agree with me. To be anglo-saxon, hispanic, or Italico, one must completely know the language of the country that this culture comes from. Do you agree or no? PB: Yes, it’s the language of the culture, not really of the country. The Florentines spoke Italian before Italy existed as a political organization. This is the Italian phenomenon because Italian is one of the few cultures that had language in common before the culture itself. FP: Can soccer, as an Italian plays it, be considered Italic soccer? Bassetti: Yes. Soccer is an Italic invention because it was invented in Florence and regulated by the English. Anyone who knows the United States understands that poker is an American game. If one goes to Russia, he realizes that chess is the game of the Russians. The game of Italians is soccer. FP: I notice that, in general, the Italian palate is more refined in terms of being able to distinguish between a good tomato, a good cheese, a good oil. There are people abroad who don’t know how to make this distinction because they didn’t train their palates. PB: My book strives to make people understand that the awakening of Italics comes from more than just Italianness. It comes directly into contact with the whole world. With “Glocal,” the central idea is that everyone locally is part of the global society, but the global permeates all the local environments in different ways. FP: My mother has a great doctor, who is of Sicilian origin from the island of Lipari. He traveled a lot across the world but had never been to Italy. I went to Italy last year, and I decided to go to his city to buy goat meat for him because goats are their most famous product. He has an excellent education among some of the most accomplished doctors in his specialization, but he never dedicated himself to discovering his Italian, Sicilian, and Italic side. I tried to wake up to his Italian side. He told me a few days ago that now he wants to go to Italy to understand a place in which this somewhat strange yet excellent flavor of goat can be a key part of his identify. If you’re interested in learning more about Italics, be sure to pick up a copy of Bassetti’s book Let’s Wake Up, italics! Manifesto for a Glocal Future.